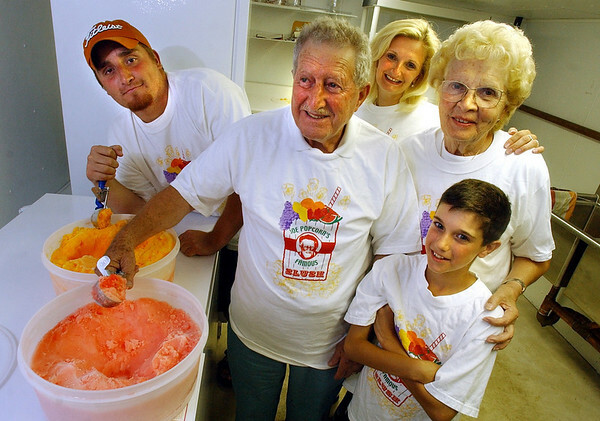 Gloucester: The family of Joe Ciaramitaro, center, otherwise known as "Joe Popcorn," has started up the family business again after about twenty years of retirement for Joe. From left is Joe's grandson, Anthony Curcuru, Joe, daughter Gina Ciaramitaro, wife Rose Ciaramitaro, and grandson Zachary Ciaramitaro, 11. (Photo by Mike Dean/Gloucester Daily Times). Monday, July 28, 2003 (NOTE: THIS IS A DIGITAL CAMERA IMAGE).